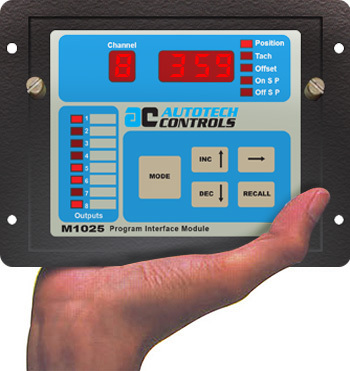 The M1025 Series Brakewear Monitor from Autotech is the most cost effective OSHA compliant stand alone Brakewear monitor system and includes a rugged 3/8” shaft resolver. M1025 measures the press stopping time after it receives brake activation signal. 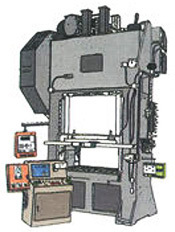 The resolver is used to detect press stoppage. The M1025 system is also expandable to include up to 6 PLS outputs.. Normally blank, it is a hot plug-in programming panel to program various motion detector and brake monitor settings. It can be removed after the brake monitor has been programmed. M1025 Brake Monitor system comes with a heavy duty, double bearing, 3/8” shaft, NEMA 13, E7R Resolver specifically designed for press applications. Displays Position, RPM, Production Rate ON setpoint and OFF setpoint stopping time, brake danger limit, motion limit. With M1025 Brake Monitor, the user can view the stopping time of the press, as well as control an output, called Brake Monitor Output. The Brake Monitor Output is a fail safe relay output (normally energized). The user programs the danger limit. The brake monitor output is de-generized if the stopping time is more than programmed danger limit. The output can be reset by contact closure on brake reset input. Pressing the MODE key in the Motion Limit Mode will take the user into Stopping Time Viewing Mode. This mode is related to the brake monitor feature of the M1025. The user will be able to see the time in seconds it takes for the shaft to stop from the moment the brake input is applied. The “On/Off” set-points for each output can be programmed simply by the touch of a key from the front panel. The Autotech patented key sequence in the M1025 is incredibly simple and easy to use. Unlike an electromechanical limit switch that required periodic maintenance and often at places that are hard to reach, the M1025 PIO requires no maintenance and has no mechanical cams/contacts to wear out. In addition, the plug-in output relays are easily field replaceable. 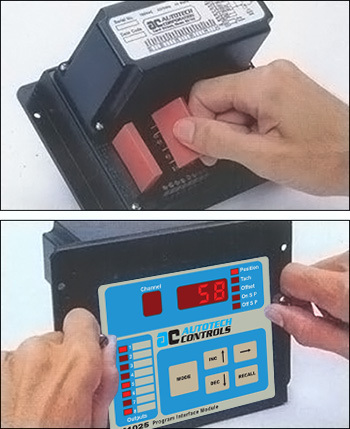 Once the set-points are programmed using the front panel programming interface, you can detach it from the main unit making the program inaccessible to any unauthorized personnel. While this feature makes the M1025 tamper proof, it also saves you money by using the same programmer to program various ocher PLS's in your plant. The M 1025 allows another level of security against unauthorized programming changes. In addition to the detachable programmer, you need a contact closure at the back ofM1025 to enable programming. The M1025 combines the ruggedness of a brushless resolver and reliability of an advanced solid state control. The rugged heavy duty NEMA 13 (IP54) resolver can be mounted on a machine shaft in hostile environments, such as mechanical shock, vibrations, extreme humidity and temperature changes, oil mist, coolants, solvents, etc., and the programmable control unit M1025 can be mounted up to 2500 ft. away in a control panel. The splash proof, oil-tight, front plate permits the unit co be installed directly on the machine itself, if so required. The ratio-metric converter used in the M1025 assures high noise immunity and short-circuit proof resolver wiring. Unlike some other attempts to replace cam switches with incremental encoders and/or counter modules in a PLC, the M1025 PIO maintains one crucial feature of cam switches...it is totally absolute. The M1025 will give you reliable limit settings irrespective of power outage as well as during severe electrical noise! As an added feature, Time-Based Brake Monitor and Motion Detect are built-in to this unit. The PLS senses a press run signal and after a field set time delay, if no motion is detected, a motion fault signal is generated. After loss of the run signal the brake stopping time is determined and displayed on the front of the unit.